Welcome to Tools to engage. This page contains links and documentation about tools that you can use for a multiple-purpose. The tool itself makes something meaningful eg. helping people having a map of the place they live, and second the tool uses Creative Commons. So because of Creative Commons you can have meaningful projects like these. Mapillary, OpenStreetMap, MapSwipe, Unsplash and more. Video made by Mapillary telling how Mapillary works with Creative Commons. I hear numbers like; 1 billion people dont have a map of the place they live. This and many other reasons could be an argument of looking at OpenStreetMap and do some mapping. It is easy to get started. 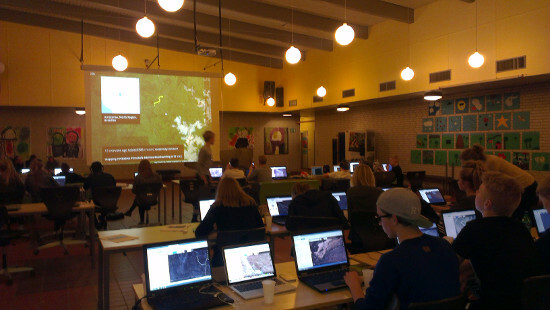 The picture above shows the biggest mapping party in Denmark, held at a school, where 30 pupils (8th grade) mapped an evening until midnight. Video showing activity around the world as a heat map. cc:by-sa itoworld. This video helps me explain how big and vibrant an online project can be. To get started visit OpenStreetMap.org and the blog around it. See if you have a community in your country that you can contact. The video below can also be a good start. Tip: Start mapping somewhere needed so that you can get familiar with the basics (roads, buildings and so on) and where the aireal footage is good. MapSwipe is an app on your phone making. You recognize buildings on photos and your marks are send to OpenStreetMappers, so that they know where to start mapping in areas with poor maps. The site with more than 400.000 pictures under CC0-licens has made two interesting apps. One for the consumer (Unsplash) and one for the producer (Unsplash Uploader). The Uploader app is for people who wants to give the photos to the public domain, and that can be quite engaging to some. This project is about making voice recognition open and free.